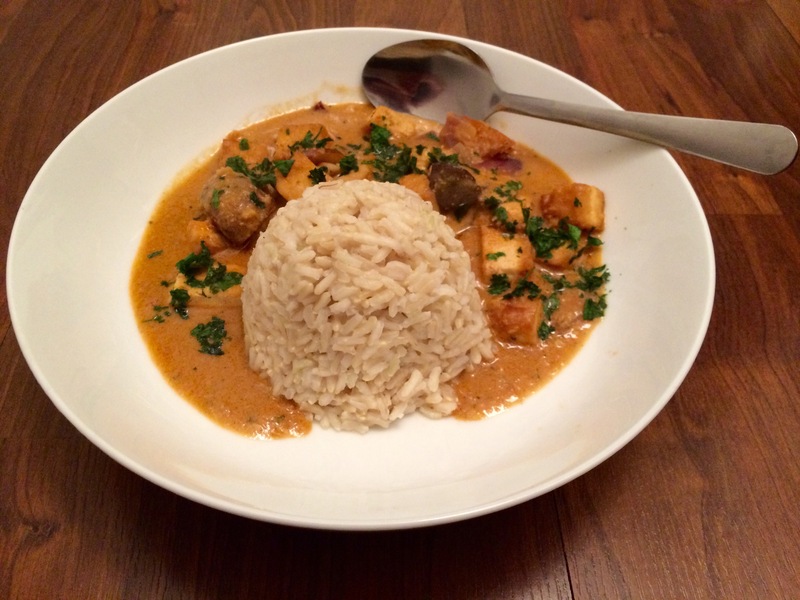 Penang curry, named after an area on the northwest coast of Malaysia, is a rich, fragrant and creamy Thai curry. The main players in this recipe – nutty chestnut mushrooms and fried tofu – are the perfect ingredients to soak up all of the sensational spices in the penang sauce. Penang curry is without a doubt my curry of the moment. I can’t express how much I love it. I can’t stop eating it. I don’t want to stop eating it. It’s so tasty. The aromatic flavours of ginger, red chilli, coriander and lemongrass work well with creamy peanut butter and coconut milk. It’s milder than Thai green or red curries and more of a comforting choice with the creaminess from the nut butter. There’s a street food stall on Lower Marsh Market in Waterloo, London, that serves the best tofu penang curry I’ve ever tried. I’m addicted to it. I try to limit myself to eating it once a week as the portions are huge (and I don’t like to waste food). To feed my addiction and cut back on pricey lunchtime treats, I wanted to have a go at making it myself. A lot of the recipes I browsed online use ready made Thai red curry paste, but I prefer to make sauces from scratch where I can, to avoid extra unnecessary sugar and additives, so I decided to make my own paste. I found About Food’s red curry paste recipe a great base for inspiration, making a few tweaks along the way. There are quite a lot of ingredients involved in making the paste, but it’s totally worth it. It only takes five minutes to put together. It’s so fresh and aromatic. Serve this curry with your choice of rice (I always use brown rice), a sprinkle of fresh, chopped coriander and a drizzle of sweet chilli sauce on the side for a bit of extra kick. Drain the tofu. I find the best way to do this is to place it on a plate and carefully balance a heavy object(s) on top – I usually opt for a chopping board and big saucepan. Leave it for 15 minutes or longer if you can be bothered to wait, to get as much water out of the tofu as possible. Meanwhile, prepare the paste. Put all of the paste ingredients into a measuring jug or high-edged piece of tupperware and whizz everything up with a hand blender until smoothish. At this point, if you’ve opted to cook brown rice, put it on to boil now as it takes 25-30 minutes to cook. If you’re using an alternative, follow the pack instructions. Next, put a large frying pan on a medium heat and pour in the oil. While the oil is heating up, remove the tofu from its makeshift clamp and chop it into small cubes. Add it to the pan and cook for 5-7 minutes, turning regularly till it’s golden. Remove from the pan with a fish slice or similar utensil, so the oil remains in the pan. Pop the onion and mushroom into the pan and cook for a further 5-7 minutes, until they begin to soften. Add the tofu back to the pan. Transfer the curry paste into the pan and stir in with the veggies and tofu. Cook for a minute or so and then pour in the coconut milk. Bring to the boil, stirring frequently so the coconut milk and curry paste blend in together. Simmer for 15-20 minutes, until the sauce has turned a rich light red colour. Season the curry well and serve with the rice, sweet chilli sauce and fresh coriander. Adapted from the Picky Eater Blog’s recipe. This is a fabulously fresh fishy noodle dish stir-fried in a smooth and rich satay sauce. Featuring succulent shrimps, crisp mangetout and sweet and juicy strips of baby courgette, this meal is inspired by the delicious flavours of Southeast Asia. 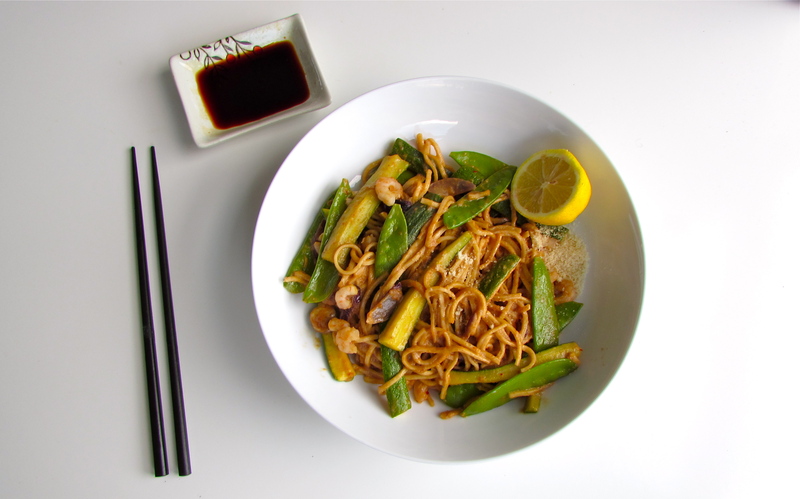 Made with wholemeal noodles and low fat coconut milk, not only is this stir-fry healthy; it’s packed with protein, is quick and simple to make and ticks off a couple of your five-a-day with its gorgeous green veggies. As featured in The Guardian’s Readers’ recipe swap. Put a large frying pan or work on a medium heat and pour in the sunflower oil. Add the sliced onion and cook for 5-7 minutes, stirring regularly, until it begins to soften. Meanwhile, make the paste: put all of the satay sauce ingredients – except for the coconut milk – into a measuring jug, or another high-edged container and whiz together using a hand blender. This may take a little while because the peanut butter is thick and sticky. After a minute or so of blending, the mixture should form a thick paste. When the onion has softened, stir in the paste and fry for a couple of minutes. Add the coconut milk and stir frequently for a few minutes, until the paste has mixed in well and the milk turns a light orange colour. Reduce the heat and simmer for 10-15 minutes. Boil the kettle and place the two wholemeal noodle nests into some tupperware. Pour over the boiling water and use a fork to break up the noodles a bit. Leave to soften in the tupperware. After you’ve left the sauce to simmer for a couple of minutes, add the mange tout and courgettes and leave to cook for the remaining 10 minutes. Defrost the prawns by pour cold water over them for a minute or so, until they feel soft. Add the prawns to the pan and stir in with the sauce. Once softened, drain the noodles and add to the pan. Stir them in so they’re evenly dispersed with the veggies and prawns. Serve in large bowls with a side of crushed peanuts and a wedge of lemon or lime.